DVD Clone Guide - Clone DVD movie to DVDR in 20-40 minutes! Guide - How to copy my DVD movie with AoA DVD COPY? Ensure the DVD you wish to copy is clean (no finger prints) and not scratched. Use high quality recordable DVD disc like Verbatim, CMC, Ritek, Sony, Fuji, etc. Avoid using cheap discs. Always refer to the DVD writer manufacturer for the list of recommended discs for your DVD writer drive. Ensure you have sufficient hard-disk space (at least 4.3 GB). 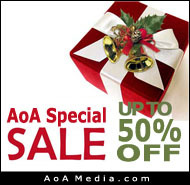 Start AoA DVD COPY and your DVD movie in your DVD-ROM would be loaded automatically. Press the "Import" button to change your source location, which could be another DVD drive or hard drive. Press the "Export" button to change your target location. AoA DVD Copy provides 3 copy modes - Whole Disk, Main Movie and Split DVD-9. Whole Disk - 1:1 copy your DVD movie onto one regular DVD+R/RW DVD-R/RW disc, keeping all the DVD special features, menus, subtitles and audio tracks. Main Movie - Copy main movie onto one DVD+R/RW DVD-R/RW disc removing unwanted subtitles/audio to increase quality. Split DVD-9 - Split and copy a DVD9 movie to 2 DVD5 with all the special features, menus, subtitles and languages. 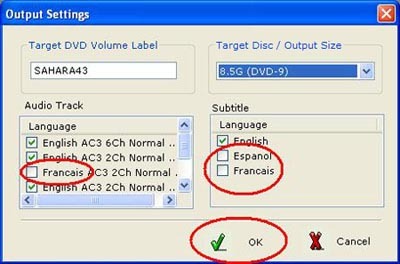 The Whole Disk mode and the Main Movie mode allow you to select audio track and subtitle language. You can also make the output size to fit in a DVD disk.